This summer we didn't travel anywhere outside of the province, so we decided to make it special by taking daytrips to spend time together as a family. It turned out to be a really memorable summer, there are so many things to do around Calgary and in the mountains, and so much of it is free! We have a long list of places to check out next year because there were too many to fit in this year. With summer at an end but the good weather stretching on, we've been taking every opportunity to enjoy being outside together before winter arrives. If you're looking for an easy, local day-trip this weekend, look no further. We've fallen in love with the East Village (and would live there if we could afford it! ), the city has done such an amazing job of rehabilitating and revitalizing the area. St. Patrick's Island has been part of that, and if you've never heard of it, you're not alone! I feel like it's one of downtown Calgary's best kept secrets. St. Patrick's Island is in the middle of the river and you can only get there by walking to it from the George C. King Bridge, or parking at the Calgary Zoo's back entrance (which was closed when we went, since the bridge to Inglewood isn't finished yet). We parked in the East Village and just walked over. In case you didn't know, you can take advantage of free street parking downtown after 6 p.m. every night and all day Sunday. There's so much to explore on the island, either by foot or by biking around. We spent a ton of time at the Playmound, I was excited about exploring it as an adult, let alone the kids! 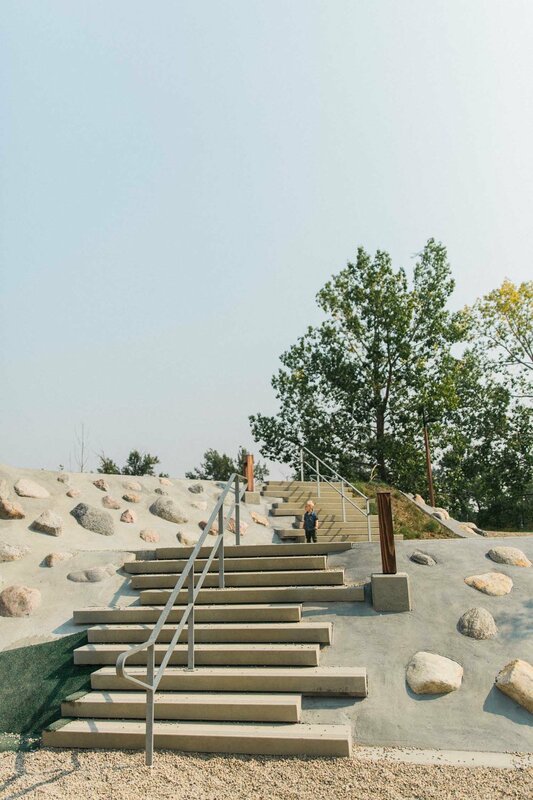 It's a really awesome park with so much to do, definitely on our favorite playgrounds in Calgary list. James was a little small to do some of the activities independently, but he ended up spending most of his time in the little log cabin, making and serving me ice-cream. Lot's and lot's of it. "More?" The slide is a little intense (I'll admit I was pretty scared to go down it), the sign suggests it's for 6+ and for once I might actually agree with that! Watch Curtis's face in the video when he tries it, haha. I was busy making fun of him for falling off of the balance thing, so when I tried it of course I biffed it hard and ended up crashing to the ground. We took a walk up the Rise, a large grassy hill with stairs on the backside and a perfect slope for rolling down on the other, with a huge fire-pit to use on the top. It's a designated tobogganing hill, so we will certainly be back come winter time. We stopped on Trout Beach so the kids could wade into the water. It's a pebble beach, so they went to town throwing rocks in, and there's a ton of seating around everywhere, such a great spot for a picnic.